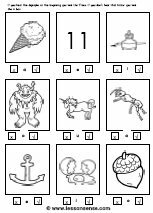 The children will have to find the starting letters: b, a, z, k, b, and n.
this exercise contains out of 2 worksheets. scissors, glue and paper are required. 4 letters are placed in a box, the pictures that end with that letter should be coloured. 2 answers per box are correct, and 2 are false. 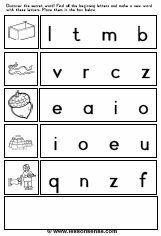 the consonant t is selected for this exercise. 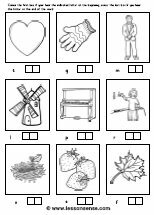 the object of this worksheet is to colour or circle every picture that ends with a t.
this worksheet will check if the children can place the letter with the correct picture. 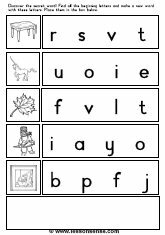 this worksheet checks knowledge of vowels and consonants. 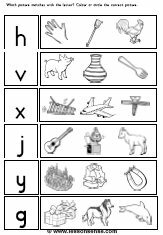 the children have to find the starting letter of the indicated picture. all the letters combined make a new word, a secret five letter word and it makes this activity all the more fun. 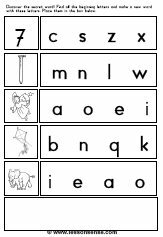 this worksheets checks the knowledge of the consonant -s as a starting letter. you can also let the children cut out all the pictures that start with -s, instead of drawing lines. 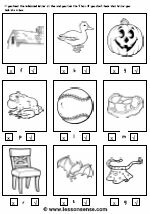 this worksheet indicates a new letter for every picture. the object of the worksheet is to indicate this letter as a starting or an ending one. 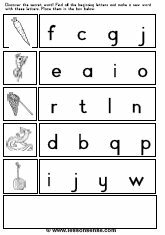 this worksheets checks the knowledge of the consonant -b as a starting letter. a true or false method is used for this worksheet. 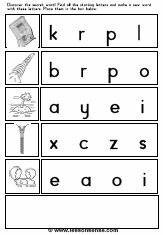 this worksheet checks the knowledge of consonants only. 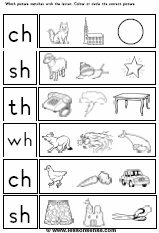 this worksheet checks the knowledge of digraphs only. 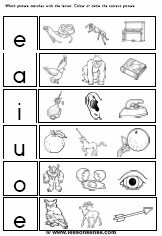 this worksheet checks the knowledge of vowels only. 2 pictures in each row rhyme. the children will colour the 2 pictures that rhyme. you can also cut up the worksheet and make a new copy so the images are scrambled through out the page. The children will have to cut out all the pictures and select the ones that rhyme.